Application Performance Monitoring (APM) is clearly indispensable to any organization adopting a DevOps approach – and frankly required for any organization in general running applications to support business objectives. APM provides insight in the non-functional behavior of applications – or better yet: of the business functions provided by these applications. It alerts administrators to functions that have unacceptable response times or are at risk to display poor performance and it allows us to analyze these situations to figure out where in the application stack – front end, services, integration flows, database, etc. – and in which specific component the problems have arisen. After performing this type of root cause analysis, resolving the problem still needs to be done, but is kick started as early as possible and with as much analysis details as possible. In that earlier article, I also demonstrated how monitoring can be set up for Node (JS) applications. In this article, I will work with the APM Java agent. This agent can be installed and configured for a range of Java EE application servers – including Oracle WebLogic Server, Apache Tomcat Server, JBoss/WildFly, IBM WebSphere Server. It will observe the activity in the JVM and derive meaningful metrics from its observations. These metrics are forwarded to the OMC cloud where they are stored, processed, visualized and analyzed. 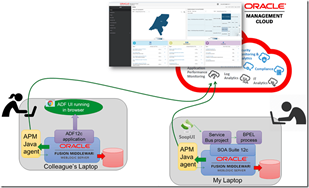 In this article I will apply the APM Java Agent to an existing Oracle WebLogic plus SOA Suite environment. After installing and configuring the agent, I have to make one small change to the WebLogic startup script, (re)start the server and subsequently and activity on that server is reported to OMC and exposed in the APM Dashboard and analysis screens. Subsequently my colleague executed the same steps on his personal laptop, using an agent with the same registration key and applying this agent to a WebLogic Server running an ADF application against a local database. Within minutes, the metrics from his machine and his ADF application appeared in the APM section of OMC, ready to be analyzed. (this particular ADF application is intentionally equipped with a number of performance black holes, for training and demonstration purposes; OMC APM was capable of identifying most of them. Read the complete article here.